Hold plants at 60F for a few days prior to shipping to reduce chances of chill damage during transit. Various watering and fertilization practices during production does not seem to influence plant quality once placed in less than ideal interior conditions. Member of the Marantaceae (arrowroot family). Native to the Tropical Americas, especially in the Organ Mountains of southeastern Brazil. 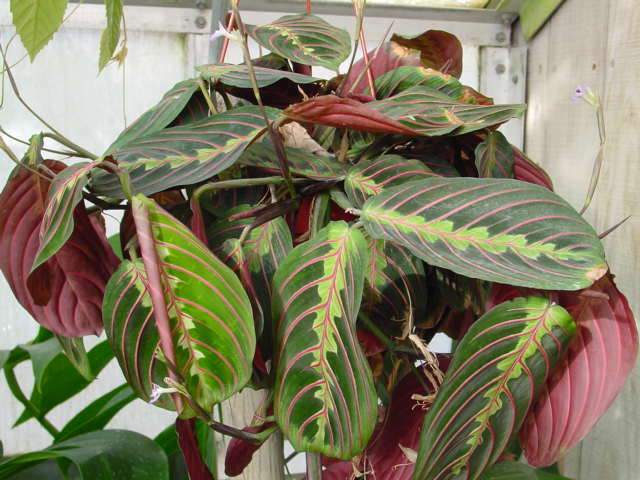 Two fairly common relatives are Calathea (zebra plant) and arrowroot. Leaves are rounded, up to 6 inches long, 4 inches wide, often multicolored in bands. Chill sensitive, store above 55 degrees F. Preconditing plants at a cool 60F prior to exposing them to a chilling temperature of 50F for 4 days resulted in them being able to withstand up to 8 days at 41F with no chill damage. The specific epithet name “leuconeura” means white-nerved, possibly in reference to its leaf markings. Named after B. Maranta, a Venetian doctor and botanist who died in 1754. It gets one common name from the fact that its leaves tend to fold together at night like praying hands. Does well under low light levels and can even thrive under fluorescent lights. Poole and Conover (1993) stored ‘Kerchoviana’ at 36-46F from 1-4 days and subsequently noted no damage.